On Wednesday, November 15, 2017 Scovill Fasteners CEO Craig Stoudt and HR Director Kim Brookshire awarded Fran McCay recognition for her 55 year tenure at Scovill Fasteners. Fran has the longest active career at Scovill Fasteners on record. 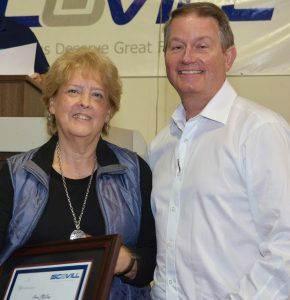 She has worked in several important roles across different departments at Scovill and the company is grateful for her dedication. It is hard-working employees like her who uphold the Scovill values of Partnership, Service and Expertise.